Avocado cheesecake is an unexpected sweet treat that delivers citrusy flavor, bright color, and a nearly-hidden healthy punch. In food processor, pulse walnuts until finely ground. Add graham cracker crumbs, 1 tablespoon stevia, anise, and salt; pulse several times to combine. Add 2 tablespoons water and pulse until ingredients resemble coarse sand. Press into bottom of lined muffin cups; bake 10 minutes. In measuring cup or small bowl, combine gelatin with 2 tablespoons water; let stand for 5 minutes. With vegetable peeler, remove strips of lemon zest (yellow only). In a saucepan, combine milk, 1/2 cup sugar or stevia, vanilla, and lemon zest and bring to a bowl. Add gelatin and simmer until dissolved (about 1 minute). Strain and discard lemon zest. In food processor, combine avocados and cream cheese. Pour hot milk mixture into food processor, and blend until smooth. Pour into baked crusts, cover, and refrigerate at least 2 hours or until set. 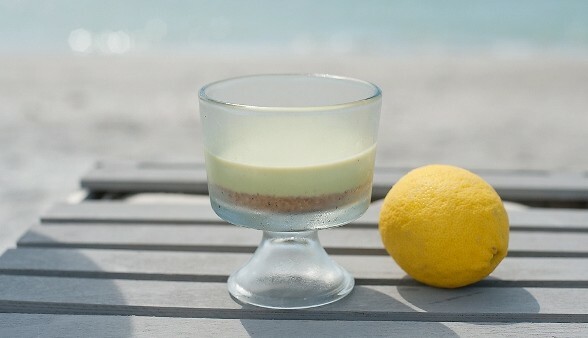 Serve, if desired, with tiny lemon or lime wedges. Baking time: 10 minutes. Chilling time: 2 hours. Standing time: 5 minutes. Recipe by Angela Sackett (dancingwithmyfather.net). Photo by Angela and Anna Sackett.